Snow crabs might also be marketed as queen crabs or spider crabs, as they're part of the spider crab taxonomical family. But for our purposes, the term snow crab will refer to only the true snow crab: Chionoecetes opilio, or the opilio. Opilio crabs don't grow as large as some of their other underwater brethren. Across their disc-shaped carapace, mature female crabs usually measure between 1.5 to 3 inches and mature males range up to 6 inches across. Living up to 14 years, opilio crabs generally inhabit muddy terrain on the continental shelf at a variety of depths. They'll eat pretty much anything they can get a hold of, and there's plenty of marine life that'll try to eat them first. When it comes to predators, however, Alaskan fishermen have been high up on the list for a couple of decades. Opilio crabs were one of the species that served as a replacement when the king crab fishery market crashed in the early 1980s and crab fishermen needed to diversify. Fishing was good for a number of years, until the early 1990s, when the catch peaked and started to decline. 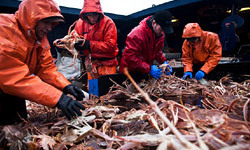 In 1999, snow crabs were declared overfished and the harvest caps were lowered. Although the species remains moderately difficult to manage sustainably, opilio fishing has continued over the years, and the 2008 quota was set at around 63 million pounds, up from about 36 million pounds the year before. In the waters off the Alaskan coast, snow crabs are caught in pots like other types of crabs with herring, mackerel and squid commonly used as bait. After the pots sit for a couple of days, they're hauled back on-board and the little opilios are processed and sold in a number of ways, such as whole, in sections, as cocktail claws, as meat or canned. During the fishing season, opilio crabs can be bought fresh or purchased frozen throughout the year.